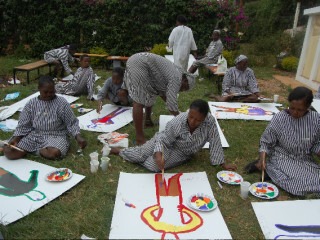 All around the world, using the arts, Harambee Arts is transforming and improving the lives of women and children who have suffered the devastating effects of trauma caused by violence, illness, poverty, trafficking and other crises. 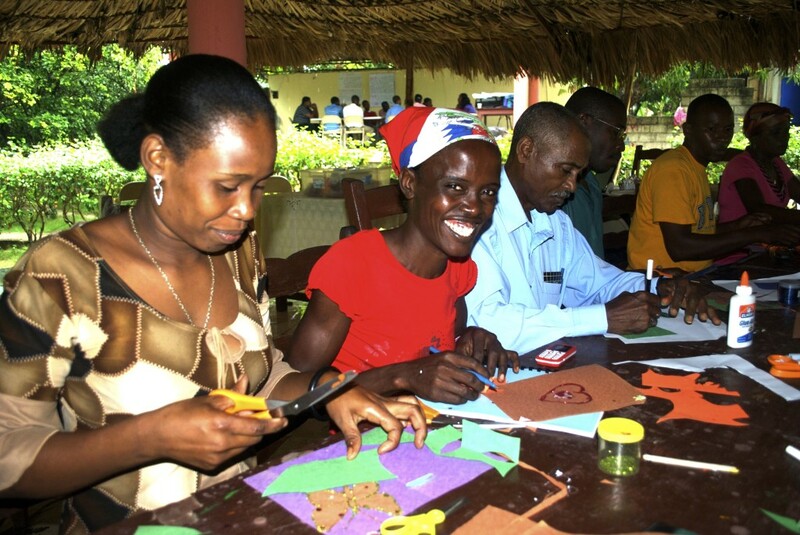 In workshops and trainings based on a form of expressive art therapy created by founder Gloria Simoneaux, participants begin to recover from deep psychological wounds and are empowered to further heal themselves and help others. Video: Harambee Arts, a small organization with huge heart and impact. 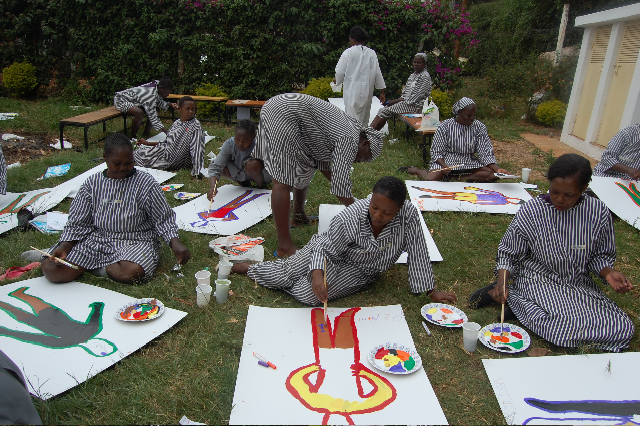 At Langata Women’s Prison we’ve created a support group for women inmates, most of whom are imprisoned for petty crimes and who are HIV+. At Mathare Special Training Centre, located in the Mathare Slum we provide art programs for children on the autism spectrum and those with other mental health challenges, who are stigmatized in Kenya. 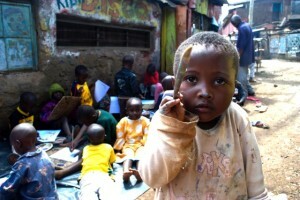 At Kibera, Africa’s largest slum, we host a healing arts program for children who live in squalid conditions. Within an environment of rivalry, crime and conflict, children of different tribes learn to collaborate and express their dreams and joys. Since 2011, Harambee Arts has partnered with Shakti Samuha (a global alliance against human trafficking) to empower the staff members, who are survivors themselves. They undergo intensive self-healing, training in training others (TOT) and as a result they are more effective in their work with newly rescued girls instead of being continuously triggered by their own painful memories. The trainers help girls recently rescued from trafficking to cope with their emotional trauma. 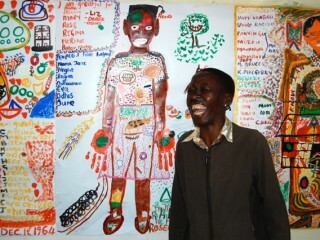 Telling their stories through art helps rebuild their identity and transforms grief and shame into courage and power. 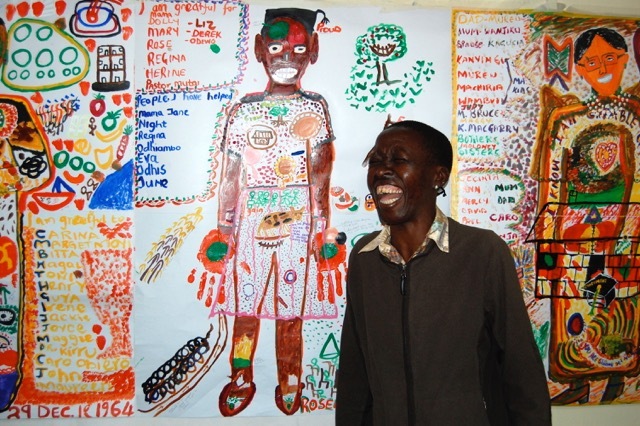 Harambee Arts has trained more than 1800 counselors, educators and other caregivers through Africa, Nepal, Haiti and the US, in the use of expressive arts therapy. Harambee Arts child-centered trainings are designed for staff of local and international organizations dedicated to addressing the needs of survivors of human trafficking and of children and women traumatized by war, poverty and abuse. In every instance we adapt our training to the particular needs of the participants. 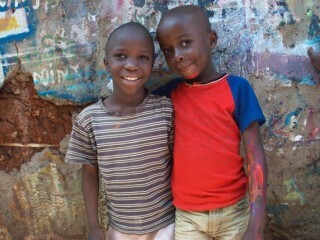 Children are empowered to become competent, ethical and socially responsible members of the community. 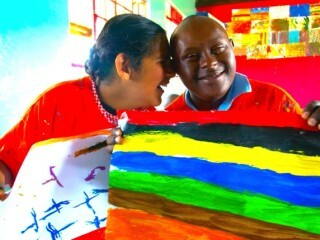 Within Harambee Arts each individual is regarded as fully capable and intact. Empathy and reaching out to others are core values. Art is used as a tool to create a secure base and to build a relationship based on trust and felt security, the foundation for secure attachment. Art is also used to explore grief and mourning of loss, a common human experience. Once a secure base has been established, the child is supported to accept and face painful experiences and to share stories. The therapy lies in the sharing of stories and in the listening. Art is a way to express feelings that are difficult to express in words. Creating art helps us to understand and know ourselves. We value the act of producing the art (the process) more than the final product (the art work). The use of art for healing creates new pathways in the nervous system and the brain and ignites people’s wellness. 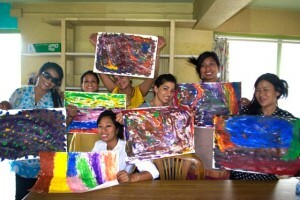 The use of Art Therapy creates an awareness of being present and deeply engaged. The use of somatic awareness exercises to demonstrate how to bring an individual back to a resilient state after a simple or severe trauma. Gloria Simoneaux founded DrawBridge, An Arts Program for Homeless Children in 1989 and she served as Executive Director until December 31, 2007. During that time Ms. Simoneaux also traveled internationally, offering trainings in the use of Expressive Arts Therapy for children and women in crisis. She made many trips to Africa where she set up arts program for children with HIV/AIDS in Eritrea, worked with young members of the Samburu tribe in Northern Kenya, trained HIV+ community health care workers in Tanzania, worked with orphans and street children in Eastern Ghana and Zimbabwe, trained pre-school teachers and orphanage staff, as well as offering individual art therapy sessions to sexually abused orphans in Zimbabwe and Ethiopia and worked with grandmothers in South African townships who were learning to be teachers after the death of so many teachers as a result of the HIV/AIDS epidemic. She also taught Expressive Arts at the University of Nairobi’s Department of Psychology, and at CONNECT, a Family Therapy Institute in Zimbabwe. In 2007 she received a Fulbright fellowship and taught for one and a half years at the Kenya Association for Professional Counselors in Nairobi. 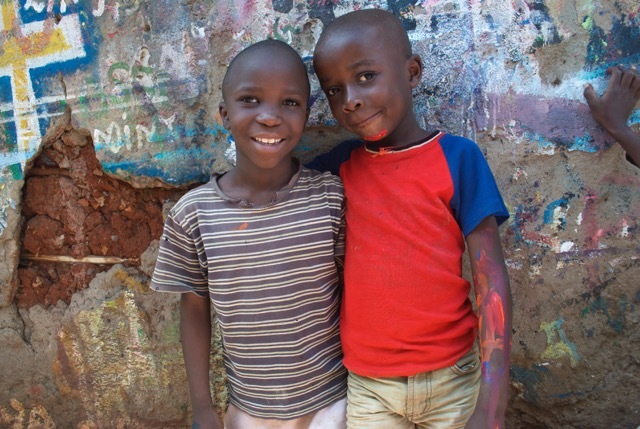 During those years, Ms. Simoneaux founded Harambee Arts, Let’s Pull Together, an Expressive Arts Program for children and women struggling with trauma, in Kenya and Nepal. 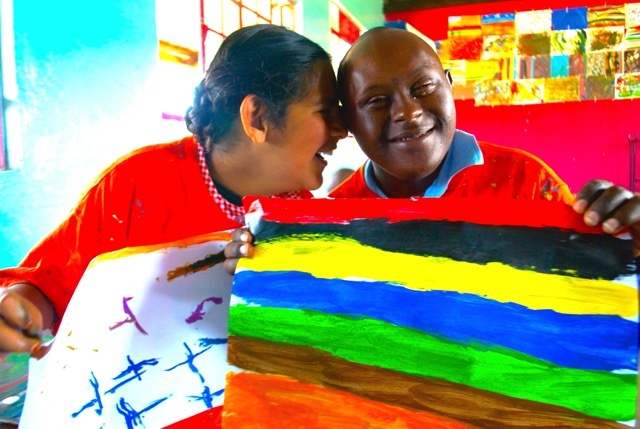 Harambee Arts partners with African and Nepali grassroots programs to train local caregivers to provide art programs for vulnerable children and women in an environment that fosters their sense of joy, creativity and exuberance. Harambee Arts is fiscally sponsored by Inquiring Systems, Inc. Inquiring Systems, Inc. (ISI) is a nonprofit 501(c)(3) corporation founded in 1978 and specializing in the improvement of the human condition by providing sound, ethical and sustainable ecosystem management services. Our services are provided primarily to nonprofit organizations, communities, governments and selected for profit entities, and combinations thereof, wherein the activities involved are consistent with meeting the ethical guidelines for developing, nurturing and maintaining the resiliency, viability and sustainability of ecosystems.